When I was growing up, I often ate migas for breakfast. Migas (Spanish for “crumbs”) is just corn tortillas fried in a pan with eggs added. Yes, this is peasant food. Inexpensive, fast and easy to make, and tasty peasant food. I still eat it today when I’m in a hurry for something good. Use cheap, local, ingredients that you already have on hand. If I have to run to the store for anchovy-stuffed olives, it’s not peasant food. Dishes should either cook hot and fast and be ready in minutes, or should cook low and slow and largely unattended. You can go ahead and look at those recipes if you like. They are by mostly white people, and I’m not sure if this sort of cultural appropriation is flattering or not. The few that are by apparently Latino people are, of course, tarted up, as if the food your grandmother served you isn’t good enough to go out without a fancy costume on. This is how I make a single serving for myself. You can play around with the proportions if you want. I take six corn tortillas and tear them into a little bit smaller than bite-sized pieces. These do not have to be fresh from the market corn tortillas, either. Like bread pudding (another fantastic peasant dish), this recipe is meant to take make use of stale or slightly stale ingredients. Don’t throw out that package of tortillas that got left open, or the one or two on the top of the stack that are slightly stale. They are perfect for this dish. This doesn’t mean that you can use some cheap brand. Most corn tortillas aren’t that expensive, but there are a couple of brands that aren’t all that good. If you wouldn’t like them in tacos, you won’t like them in this dish. Heat a couple of tablespoons of oil in a pan over medium-high heat. Drop in a single piece of tortilla, and when it starts to sizzle add the rest of the tortillas. Stir them to coat them in oil, and then cover it with a lid. Meanwhile, break a single egg into a bowl. 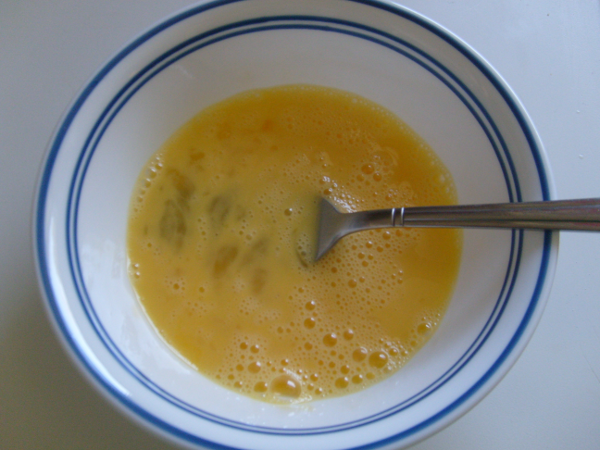 Beat it with a fork until it is fairly well mixed, then add two tablespoons of water and mix well. Adding a bit of water extends the egg. It’s close to, but not exactly the same as, using an additional egg white. 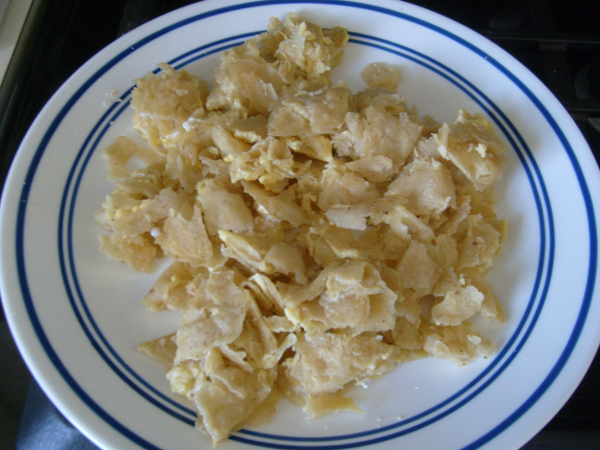 I have seen some recipes for migas which called for as many eggs as tortillas, if not more. The whole point of migas is the corn tortillas, not the eggs. Eggs are really great peasant food, but six eggs for breakfast is part of what’s wrong with the United States. Use a single egg. This is a recipe for those days when the hens aren’t laying. 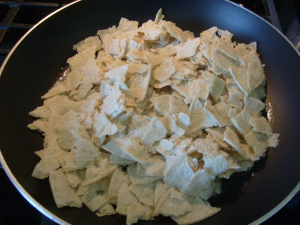 After you have the eggs ready, your tortillas should be browning on the bottom and getting crispy. Stir them, allowing them to become brown and crispy. This should happen fairly quickly. If it doesn’t, you need to turn the heat up. How long you cook the corn tortillas is up to you. They are already cooked coming out of the package, so your goal here is to heat them up and make them a little crispy. If you don’t like them that crispy, add the eggs sooner; if you prefer them really crispy, let them go for a while. I admit that the hungrier I am, the less time I leave them in the pan. As you can tell from the photo, I was pretty hungry. When the corn tortillas are done to your liking, turn off the heat and pour the eggs over. Slowly fold the tortillas and eggs together enough to mix them but no more. You want to treat eggs gently or they get tough. Once they are done on the bottom, gently turn them to cook the rest. 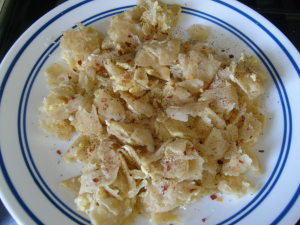 Turn your migas out onto a plate and season with salt and pepper. Yes, you can add salsa or whatever, but the point here is the flavor of the corn tortillas. Adding a bunch of extra stuff just drowns out their flavor. I do add a tiny bit of crushed red pepper flakes for heat. I find that they don’t dilute the flavor of the corn tortillas. That’s all their is to it. If this dish takes you more than ten minutes to make, or you can’t identify the corn tortillas, you are doing it wrong. This dish is and always has been peasant food, so enjoy. This is the Mexican version of the dish, by the way. There is a Spanish version (and a Portuguese version, as well) that uses stale bread. It is a bit closer to a savory bread pudding.